2/way, 8" white woofers, adjustable tweeter, bass response port. I just bought these speakers, used but very good second hand with original condition, in this December 2018 from Thailand, Mae Sot . The sound is as crystal-clear today as it was over 40 years ago of it's production date. Wow! 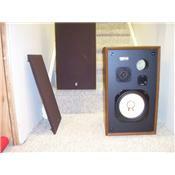 I bought these speakers, new, in 1976 or 77. The sound is as crystal-clear today as it was over 40 years ago. Although not as accurately flat as the ns10 monitors used in so many recording studios. I feel these are the softer, gentler home version of that type of bookshelf speaker. I seem to remember, the salesperson describing them as the entry level famous "Rock Monitors" of that era(1973) Can anyone verify that? Very pleasant natural sound, well balanced, efficient. All genre instruments sound accurate to me, from timpany to tubular bells. Currently part of home theater(concert DVD's in glorious 5.1!) system consisting of JBL center, surrounds and Energy 12" powered sub, Kenwood Receiver, Sony DVD/CD progressive, div/x. I was a little perplexed to not find these wonderful lifetime speakers in your database and felt an obligation to tell the world my $0.02 worth. I've owned these speakers for 34 years, by choice. I am a musician of multiple instruments for 41 years and feel this somewhat validates my opinion. Others have come and gone, these will be inherited by my survivors. Bose 501, Akai 15" woofer 3/ways.